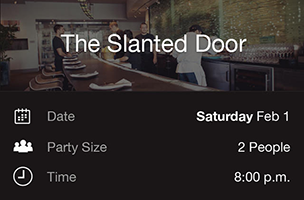 Restaurant reservations platform Table8 has officially launched on iOS and Android devices, giving users a hassle-free way to score tables at popular restaurants, without the need to reserve their spot days or weeks in advance. Now available in the San Francisco area, Table8 supports both restaurants and consumers with its fee-based service. Using Table8, users browse a series of restaurants throughout their city, and can search by date or by restaurant. Each restaurant has a list of available party sizes and available reservation times, with a reservation fee for each. Users can pay their reservation fee with a credit card, with reservations being available up to the day of the needed table. Reservations listed within Table8 aren’t available on other platforms, like OpenTable, and are also unavailable via direct booking. Table8 currently supports 12 restaurants in San Francisco, but the company is working to add more locations, and more cities, in future updates. This includes support for Chicago, London, Los Angeles and New York City. For consumers, Table8 provides access to restaurants that may otherwise be unavailable, and for restaurants, the platform provides a new revenue stream to help owners expand their businesses. “Table8 benefits customers and its restaurants by giving restaurants a revenue share that supports growth and scale. Because Table8 is a highly curated set of the hottest destinations in a given city, restaurant owners have already been reaching out to us to be included in the service,” added Santosh Jayaram, Table8 co-founder. Table8 is now available to download for free on iOS and Google Play, and is also accessible via the web. Check back soon to follow Table8 on AppData, our tracking platform for mobile and social apps and developers.